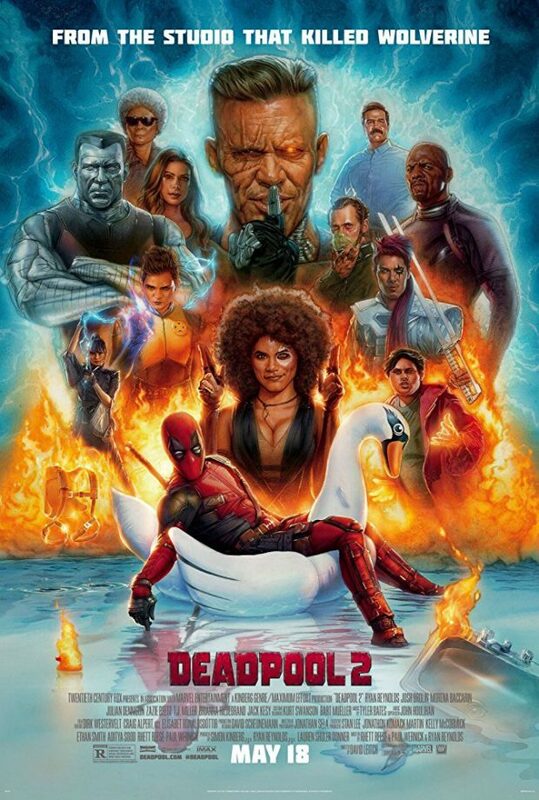 The merc with the mouth returns for another dose of foul mouthed fourth wall breaking comedic action in David Leitch’ Deadpool 2. Deadpool was considered a refreshing surprise for many when it was released because it was a superhero movie with an attitude and a more mature rating allowing more freedom to ramp up the violence and the language. In a landscape of superhero movies aimed at the family market it felt unique at the time despite hardly being the first movie of its type targeted at more mature -or should that be immature?- audiences. It was a big hit so now we have a sequel and this definitely numbers among the sequels that employ the “same but bigger” rule. This escalation is common because it’s easy enough to up the ante and deliver more of what fans liked about the first film. As such, Ryan Reynolds’ Wade Wilson is quippier than before, breaks the fourth wall a lot more often and is more unspeakably violent than he got to be in his first outing. None of this is bad because Reynolds is completely able to sell the whole thing with his trademark irreverent charm in a way that stops just short of being obnoxiously irritating. It’s a tough line that Reynolds walks with this performance but he does it wonderfully proving that he’s the right choice to play the character. The story is something of a riff on Logan with Wade tasking himself with the protection of a kid named Russell (Julian Dennison) who takes stroppy teen to a whole new level with his fire powers making him a danger to himself and others. A life changing event earlier in the film inspires Wade to focus on helping Russell which puts him in the cross hairs of the time travelling Cable (Josh Brolin) who comes back to the past looking to end the young delinquents life. Wade’s protective streak gets in the way of that and the film plays out from there. Josh Brolin is great here as he always is. Cable looks great as a character and Brolin’s menacing attitude combines with his menacing physicality to make him a formidable presence. It does take a while for him to be introduced and in some ways he fades into the background here and there but every scene featuring him is great in one way or another. A film featuring Deadpool as the main character is never going to be a complex character study because that’s just not what these films are going for but I found myself surprised by how well Wade’s character arc came across. The motivation was a bit predictable and it does follow familiar beats but it accomplishes what it sets out to do. Wade begins the film as something of a loner rejecting the idea of belonging anywhere and calling anyone else a family and progresses towards finding that idea more palatable. Once again it’s simplistic and often made fun of in the film itself but it’s a coherent arc that plays out fairly well. That’s the secret of these films as far as I’m concerned. The two films that we’ve had so far keep the jokes flying while telling a story that is taken just seriously enough to not descend into farce. Breaking the fourth wall is a difficult thing to get right but both films use it creatively and confine it exclusively to Wade who talks to the audience and makes references that the other characters don’t get while they look on with clueless expressions. It works and adds an extra layer of comedy as Wade can simply be seen as someone who is insane in the world he lives in while making pop culture references with a knowing wink to the audience. They are specifically geared towards comparing this film to others in the genre or pointing out various tropes that the film employs to keep the plot moving. It’s cleverly done and allows the unique style of these films to stand out while following storytelling conventions to create a plot that is actually worth investing in. As is joked about in the trailer, Deadpool 2 explores franchise possibilities with this film serving as a springboard for a potential X-Force movie in the future. Most of the characters that are featured have limited franchise potential for reasons that are far too hilarious to spoil but the obvious standout here is Domino (Zazie Beetz) who impresses from the moment she appears and continues to get better from then on. Her luck based powers are brilliantly visualised with a domino effect of circumstances bringing good fortune to her as well as misfortune of others and she’s consistently a badass with a lot of extra personality thanks to Beetz’ impressive performance. If one character deserves to be seen again in future films then it’s definitely her. As I’ve mentioned before this sequel is a lot bigger in every conceivable way when compared to the first outing. This definitely applies to the action with a number of high octane memorable set pieces making great use of Cable’s technology, Wade’s healing abilities, the powers on display from the other characters and certain environmental considerations. They aren’t necessarily unique but they’re well executed with some really impressive hand to hand combat sequences that flow seamlessly with a coherent sense of progression to them. The humour isn’t lost in these moments either which definitely makes a difference. The film isn’t without its flaws. It lacks a strong villain for one which makes the third act feel a little limp and the whole experience could stand to be a little shorter overall. It never becomes boring at any point but there is a tendency to overemphasise things which does result in a loss of momentum. It’s a very funny film but not all of the jokes land as with any comedy though I’m glad to say that more of them work than don’t In general it’s a worthy follow-up that improves on the first entry in some ways while not delivering a perfect experience. In short if you like the first one then this will likely entertain you as well. Stick around for some of the finest post credit sequences ever put to film. A worthy follow-up that makes every attempt to go bigger than the first entry while succeeding for the most part. Ryan Reynolds is still great in the lead role, Wade’s character arc works well enough in conjunction with the story and more of the jokes land than don’t. Josh Brolin’s appearance as Cable is really well done and Zazie Beetz’ Domino is a character who should definitely be seen again. The action is really well handled while making good use of the various powers while never losing the sense of humour but the lack of a strong villain does bring the film down somewhat. A tendency to overemphasise certain things occasionally makes the film feel a little too long but none of the flaws are significant enough to cause too many issues. In short if you liked the first film then this will likely entertain you as well. Stick around for some of the finest post credit sequences ever put to film.